One of my favorite boys just had a birthday, so since I think he's going to be a future comic book writer/illustrator, I thought he should have a special pencil box for his drawing pens and pencils! With some help from my dad, we made this box (9 x 2.5 x 2.25 in) out of hickory. Once the box was made and sanded, I used sanding sealer to help bring out the natural (lovely!) color of the wood. I found that it was a great sealer to paint over (presumably because sanding each coat makes a nicer surface for the paint to adhere to)! It was much easier to paint over than the shellac which I've used on other projects. Always learning! 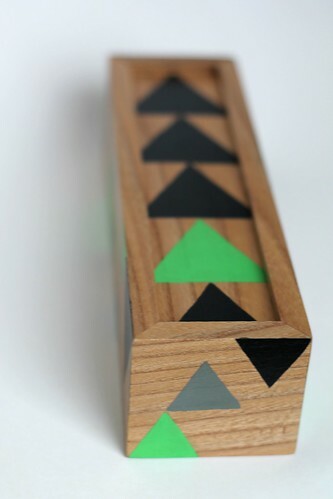 After I painted my triangle designs with acrylic paint, I finished it with a couple coats of artist's varnish. Lastly, I lined the inside of the box with wool felt, using Aleen's Tacky Glue. ...even my big boy has the idea to become a comic book illustrator....!!!! 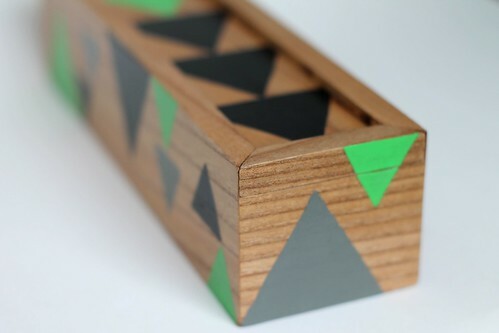 such a nice pencils box!!! 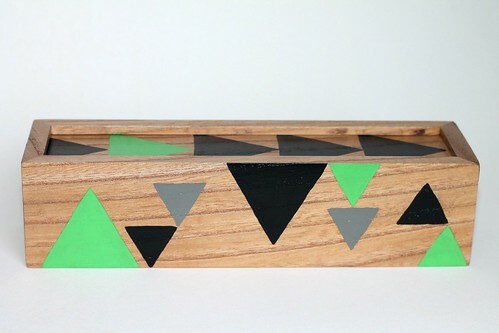 We were meant to make pencil boxes like that in woodwork at school - many years ago! I cheated and got the boys to do mine for me - I was scared of all the big, noisy machines in the woodwork shop!!! 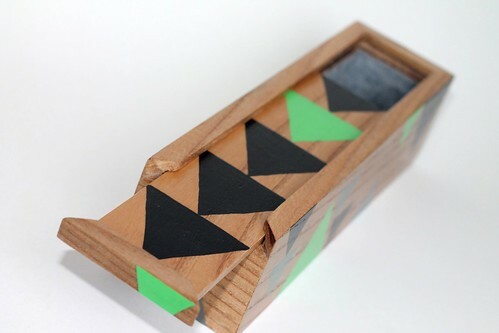 I love the black and green against the wood! What a great pencil box! I adore sliding tops and would love to own one myself. They don't seem to make them like that anymore! Very nice! What a lovely gift. Nice box. So well made. I think it will be a favorite for a very long time. You know, I really do envy your woodworking skills! For years, I've wanted to attempt learning the craft, but don't know any people who are really into it - or proficient enough to teach it. 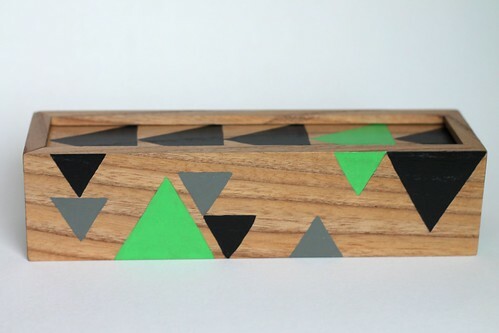 I really respect your awesome abilities at crafting such absolutely gorgeous items, everything from those groovy tables a few posts back, to this pretty nifty pencil case. There's a wonderfully vintage feel about it, and I can tell you that, as someone who was way-back-when an illustration major (artsy-fartsy student for two years), there's something really important, and really personal about an illustrator's pencil case. I still have the same, ratty pencil case I've had for the last fifteen years. It's nothing nearly as phenomenal as this, but knowing it holds those precious tools is invaluable! He's going to absolutely love it, and value it, for years - I'm sure of it. Awesome present! Thank you so much!!! I've still got A LOT to learn in the woodworking skills, and am so lucky to have a great teacher! It would be really hard to learn without having someone who has been doing it for years. Happy crafting and thanks for the kind words!